My current guesses on where this field could go. This is biased towards asymmetric codecs (offline compression for data distribution, not real-time compression/decompression). LZ4: Higher ratio using near-optimal parsing but same basic decompressor/instruction set (note I doubt the LZ4 arrow can move up as much as I've illustrated). LZHAM: Faster decompression by breaking out literals/delta literals/matches to separate entropy coded blocks, switch to new entropy decoder. Other ideas: multithreaded entropy decoding, combine multiple binary symbols into single non-binary symbols. ZSTD: Refine current implementation: stronger compressor, profile and optimize all loops. New Territory: Theoretical future "holy grail" codec which will obsolete most other codecs. Once this codec is on the scene most others will be as relevant as compress. If you are working in the compression space commercially this is where you should be heading. Note the circle is rough. 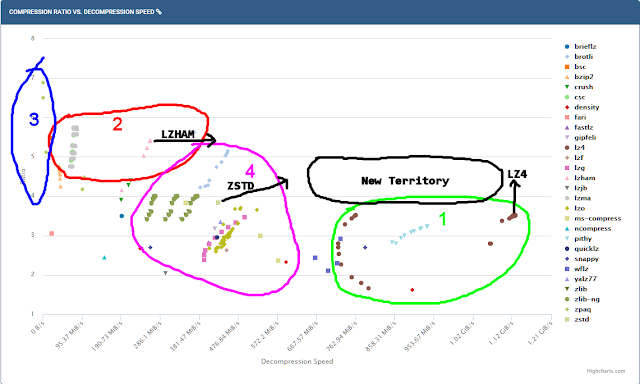 I tried to roughly match Brotli's ratio in region 4, but it could go higher to be closer to LZMA/LZHAM. Some ideas: blocked interleaved entropy coding with SIMD optimizations, entropy decoding in parallel with decompression, near-optimal parsing with best of X arrivals, cloud compression to search through hundreds of compression options, universal preprocessing, LZMA-like instruction set/state machine, rep matches with relative distances, partial matches with compressed fixup sideband. Another interesting place to target is to the direct right of region 3 (or directly above region 2). Target this spot too and you've redefined the entire frontier. - Squash benchmark - Easily explore the various frontiers with a variety of test data and CPU's. - Squash library - Universal compression library wrapping over 30 codecs behind a single API with streaming support.